Next of Kin: Son of the late Thomas Edward and Alice Clarke of Little Buckman's Cottage, Leigh Sinton Road, Malvern. Herbert Harvey Clarke was the son of Alice Clarke, a painter of 3 West End Cottages, Belmont Road, later Little Buckman’s Cottage, Leigh Sinton Road, Malvern and the late Thomas Edward Clarke. He was the second of the Clarke’s sons to die in the First World War. 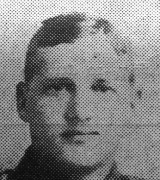 (William Clarke was killed with the 1/8th Battalion in April 1917). Herbert Clarke was killed when the 2nd Worcesters, along with the rest of 33rd Division attempted to take the heavily defended line around the St Quentin Canal. Despite the protests of the Commander of the 100th Brigade, that the attack could not be successful without more resources, the assault went ahead. The War Diary records that the men of the 2nd Worcesters were supported by a the most weak of barrages and caught by intense machine gun fire and were forced to withdraw to the original line. Casualties were very heavy – with 8 officers killed and around 220 men killed or wounded. The Regimental History states: “That sacrifice of bare men must at first seemed useless to the survivors of the Battalion – who indeed wrote bitterly of the weakness and ineffectiveness of the supporting artillery fire; but the sacrifice had not been useless. The attack had diverted much of the enemy’s artillery and had drawn to the defences in front a fresh German Division, the 30th Division, from the enemy’s reserved. Thus weakened, the enemy’s line further south had given way before the attack of the Fourth Army; and the strongest bulwark of the German defences was broken. The officers and men of the 2nd Worcestershire who lay dead in the valley of the Targelle were part of the price, an inevitable price of the decisive victory of the War, the decisive victory of the War, the greatest battle ever won by British arms.” Though certainly sounding jingoistic to modern readers when compared with the thousands of dead of the First Day of the Somme, Clarke’s death was slightly less pointless than others’. Pigeon Ravine Cemetery is on the South side of a shallow valley running East and West which was the scene of a mounted charge by the 2nd Lancers on the 1st December, 1917. The cemetery was made by the 33rd Division Burial Officer at the beginning of October, 1918. There are now over 100, 1914-18 war casualties commemorated in this site. Of these, nearly 20 are unidentified and special memorials are erected to two soldiers from the United Kingdom known or believed to be buried among them. The cemetery covers an area of 514 square metres and is enclosed by a low rubble wall.